I went with quite an experimental list – 4 Manticores, a Knight (my Tripod), 2 Valks (each with a melta-Scion squad), Plasma CCS with Kurov’s Aquila and Officer of the Fleet, 2 vet squads (melta and plasma), and an Aegis to hide behind! The Necrons had a unit of Immortals, a unit of Wariors in ghost ark, 2 units of Destroyers (4 & 5 strong), Overlord, 2 C’tan shards (one of each), 3 Wraiths, a Spyder, Annihilation Barge, and some Deathmarks with Cryptec… I set up first (castled up in the left hand corner) and got the first turn – no mission, just a straight up fight. Guard turn 1: Very little movement from me – the plan was simply to pie-plate as much as possible! 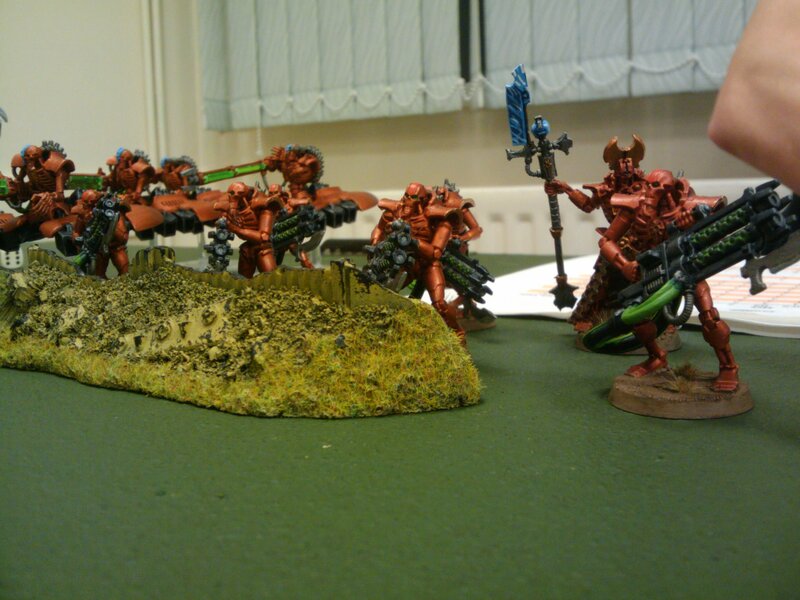 The Tripod and a pair of Manticores accounted for the whole unit of Immortals (unit destroyed – no resurrection allowed), and managed to kill the attached Overlord into the bargain, (though he did resurrect thanks to ‘Ever-Living’). The other 2 Manticores targeted the unit of 5 Destroyers, downed 4 but 2 resurected. One of the C’tan took a couple of wounds from a scatter and a speculative ‘bring it down’ from a vet squad Auto-cannon. Necron turn 1: The Deathmarks tagged the CCS and the Cryptec used the Veil of Darkness to drop them right in front of the CCS… The rest of the force stoically advanced. The Necron shooting was underwhelming – the Deathmarks took out half of the CCS (remainder saved by cover), while the rest of the shooting was fairly sporadic – a hull point off 1 Manticore (and crew shaken) and a vet or two. Guard turn 2: One of the Valkyries turned up and moved to hold up the Necrons on my denied right flank, dropping a Melta squad right next to the Ghost-ark. The Tripod started to cautiously advance, wary of glancing Necron firepower. Firing started out well, with the Deathmarks and Cryptek going down to plasma fire, while the reduced output from the Manticores succeeded in wounding a C’tan and taking a hull point off the Barge. My Melta-scions whiffed, rolling snake-eyes and missing the Ghost-ark at point blank range. Necron turn 2: The advance continued, with the Wraiths, C’tan and the remaining Destroyers getting worryingly close – the C’tan and Destroyers were now inside my 24” minimum range for the Manticores. The Ghost-ark wiped out the Scions, and general firing killed some more vets and managed a hull point off the Tripod. The Tripod also had a lucky escape as the Overlord attempted a Tachyon Arrow… he hit but fluffed the pen test! Phew! Guard turn 3: The Tripod advanced, lining up a charge on the Annihilation Barge, and my Melta vets advanced out to slow down the Wraiths. The second Valk turned up and tried the same trick as the first one on the Ghost Ark. The Tripod tagged the barge with Heavy Stubber fire, before taking out the remaining Destroyer squad with some very accurate Battlecannon fire. One battery of Manticores targeted the Wraiths, managing to take two of them down. The other battery had no viable target for their rockets, and instead tried to take down the nearest C’tan shard with Heavy Bolter fire… they failed. The replacement Melta-Scions succeeded in taking 2 hull points of the Ghost-arc – immobilising it, while the first Valk tried in vain to wound the Overlord. Finally, the Tripod charged the Annihilation Barge, and killed it with ‘Hammer of Wrath’. Necron turn 3: The advance continued, with both C’tan shards closing in to charge range, as did the remaining Wraith. The pre-charge shooting was fairly ineffective, though the Ghost-ark did kill off the second squad of Melta-Scions. All charges were made – the 2 C’tan shards comfortably destroyed one of the vet squads, while the Wraith was held by the other – despite them losing the fight. My CCS was caught between a rock and a hard place! Guard turn 4: The Tripod circled back to line up a charge on one of the C’tan, while the Company Commander ordered his remaining Plasma gunner to ‘bring it down’ on the other. The order failed (despite having a re-roll! ), but the Manticores were now free to fire on the distant Ghost-ark and Spyder, destroying the transport and wounding the beast. I was left with 3 rockets between them. The Valks both fired everything at the now disembarked warriors, accounting for a few. The Tripod charged and killed the C’tan it was facing, but the Vets lost their fight against the Wraith, broke, and were cut down. Necron turn 4: The surviving C’tan turned to face the advancing Tripod, while the Wraith targeted the remains of the CCS. The Warriors tried to target the nearest Valk, but only succeeded in taking a hull point, despite being in close range. The C’tan charged the Tripod but was crushed in the melee, while the Wraith cut down the CCS (ID’ing the Company Commander before he even had a chance to strike!). Guard turn 5: The Tripod advanced on the Wraith, determined to avenge the fallen Commander, while the three remaining Storm Eagle Missiles were sent arcing towards the Necron Warriors – (I was hoping to do the job with 2, but they scattered so badly that I needed the 3rd to finish the job). The Valks tried to plink the Overlord, but failed to make an impression. The Tripod duly charged and crushed the Wraith, consolidating towards the Overlord. Necron turn 5: With just the Overlord (on 1 wound) and Spyder (on 1 wound), the Necron turn was brief… The Spyder fired at a Valk with no effect, and the overlord attempted to charge the valk, but failed to make the distance. We did play another turn for lulz – the Tripod succeeded in killing off the Overlord, but the Spyder stubbornly held on. Obviously, the number one lesson is the power of the Manticore. They were a bit hit-or-miss, and I don’t think that they would be as effective against a lot of armies, (ap4 would struggle against Marines, fast moving Eldar or Daemons would quickly get inside the 24” minimum range, and they are totally invalid against flyers). But… static/slow gun-line armies and slow hoards will hate this thing, and strength 10 is solid against vehicles. They do need some protection for when the enemy gets within 24” – in this case I went for lots of Plasma behind an Aegis and a roaming Knight, which bought the Manticores the time they needed to fire their entire load of ordinance. Also, I think my opponent made a mistake in not advancing more aggressively, opting to move & shoot rather than run to get inside the minimum range. I think that putting Scions in them was a mistake – Scions can deep-strike all by themselves, so no need for Valks really! On the subject of Scions – I was quite ruthless with them, sacrificing them in order to slow down the advance on my right (denied) flank. They did this perfectly, (despite being a bit unlucky with their shooting), keeping a portion of the Necron army at a safe distance until my artillery could deal with it. The Tripod (Knight) was awesome, as was the more subtle CCS with Kurov’s Aquila – it is expensive at 60 points, but the 6” Preferred Enemy bubble is worth every penny as far as I’m concerned. Finally, the Aegis came good in this game, giving me a 2++ cover save (+2 for GTG) on more than one occasion. On a different note, I also learned a bit about what the ‘spirit of the game’ means to me. I have been on the wrong end of crushing defeats on so many occasions, and it isn’t a feeling I enjoy… I am not a ‘good loser’ by nature, but it turns out that being on the ‘right’ end of a kicking feels just as bad! With hindsight, four Manticores may have been over the top. Sure, I wanted to test them in a game, but my list was definitely tailored towards killing ‘crons rather than being a balanced force… This no doubt detracted from the enjoyment over the other side of the table, and although my opponent was a perfect sport, I do feel bad about it – particularly as it was a casual game. It’s a novel situation for me to be in, and I’ll need to keep this in mind in future – I certainly don’t want to be known as a WAAC player, and will try to balance my casual lists more carefully in future.